One of the easiest Christmas crafts is the Christmas tree ornament. Its so easy children can help make them. Everyone love handmade ornaments, especially with pictures in them. You could make some for friends with their kids pictures on them or else make them with your own family picture. This kids craft is fun for them to make and they can give them to their parents or grandparents. They make great gifts and the recipient will love them. The ornaments can be used year after year. You can make one every year and then the tree will have memories of every year the kids are growing up. You could also make them as cards to send at Christmas time. The great thing about them is that they create many great memories for years to come. Crafting foam, yellow, green and assorted colors for the Christmas ornaments on the tree. Draw a Christmas tree on paper. The tree pictured here is approximately 6”. You can find some trees in coloring books or else just free hand one. Cut out the pattern and trace it onto your green foam. You need a front and back. Cut a star from the yellow foam. You only need one of the stars. For the ornaments on the tree, use a hole punch and punch circles from the assorted colors of foam. Draw a circle in the middle of the tree front and very carefully cut it out. I used a small drinking glass for drawing the hole. Glue the star, ornaments and the bow to the frame front. You can use as many ornaments on the tree as you want. Center the picture on the tree back and make sure it shows in the front of the tree. Glue the picture down when you have it centered. Now glue the front frame to the back frame. With the narrow ribbon cut 5” and fold in half. Glue ends to top back of ornament. If you want you can glue the ribbon to the front of the back before you glue the front on. This way the ribbon ends won’t show. This Christmas tree ornament is very simple to make and they look so cute. Kids school pictures look real cute in them and if you make one each year you can see how they are glowing. Grandparents love them and each year they get a new one to add to their tree. 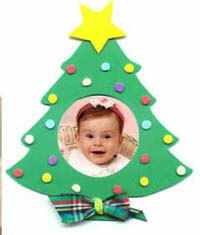 There are many Christmas crafts on this web site and I will be adding more all of the time so check back ofter.